Since 2010, the anti squat law is stating house owners would get fined if they leave their buildings empty for more than six months. Well, years later, not a single owner has been fined. That’s is no surprise knowing the City of Amsterdam. Parallel to that, 15% of office buildings in Amsterdam are officially empty. The reality would be the double. Welcome to post gentrification. Forget about affordable housing, these words are gone from the vocabulary. In Amsterdam, the price per meter square is higher in social housing than on the market price. Tenants are waiting in temporary housing for a proper one. These anti-squatters, also called “guardians” to preserve their image, haven’t been given the rights of a normal tenant. They even pay to guard houses. Not only young people and students live in this precariat. Anti-squat companies have seen their benefits exploding in recent years, while former social housing corporations have been cashing big money and forgotten since long about their social purpose. 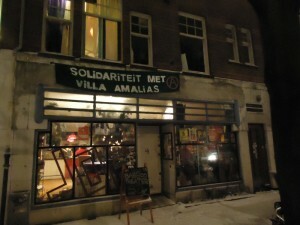 ‘There are still squatted houses in Amsterdam…”, that is the shocking gossip recently reported in the Dutch media. Is the zealous mayor of Amsterdam such an incompetent politician in matters of housing policy and in cracking down on squatters? 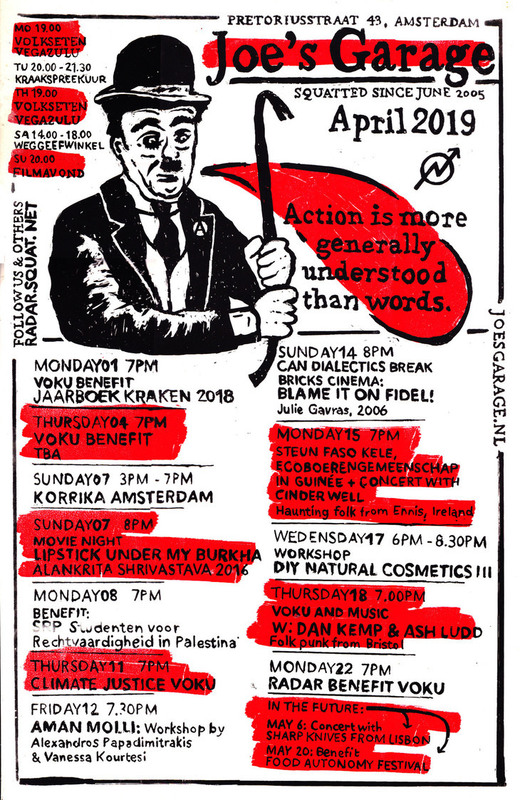 These last years, the city of Amsterdam did evict numerous squats but failed in eradicating our political structures, in making squatting history. 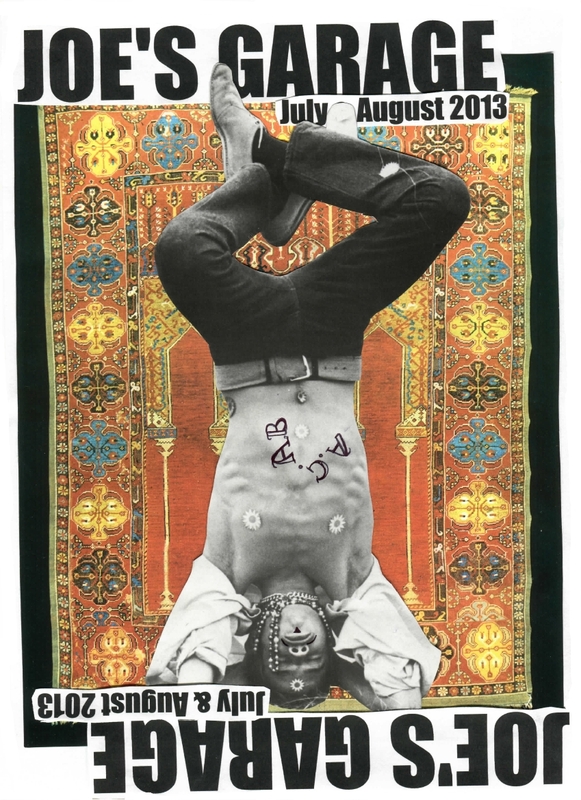 Not only squatters and activists, many individuals are daily becoming conscious and organized, building networks, taking action, sharing skills, bringing out solidarity here and there. The State could erase the (legalized) social centers from the map, call out extraordinary laws, reopen re-education camps (read – feed us more television). People would still have the will to throw down the State, disrupt the money making machine. End of April, fiscal paradise the Netherlands will finally reach world news with a fresh new young king. The media and various intelligence services are already trying to decrypt early signs of a popular revolt, starving as they are for sensation. That makes it no surprise this racist local government has no intention to lift a finger for the migrants squatting a church these last months. Opportunist politicians feeling concerned about undocumented people only brings more anger against the apathy of the State. We are not done with protesting and taking action. Knowing your rights and responsibilities when you are arrested is crucial. Joke Kaviaar will be tackling these issues during an info night. 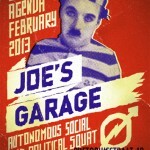 Throughout March, local activists and the many volunteers will take over Joe’s Garage to support various initiatives, Woman without Papers, Riseup.net and Anarchists Against the Wall. Other local projects, LaRage, Roomtuintje Oostbos and Soweto will provide you a deeper insight on the neighbourhood. 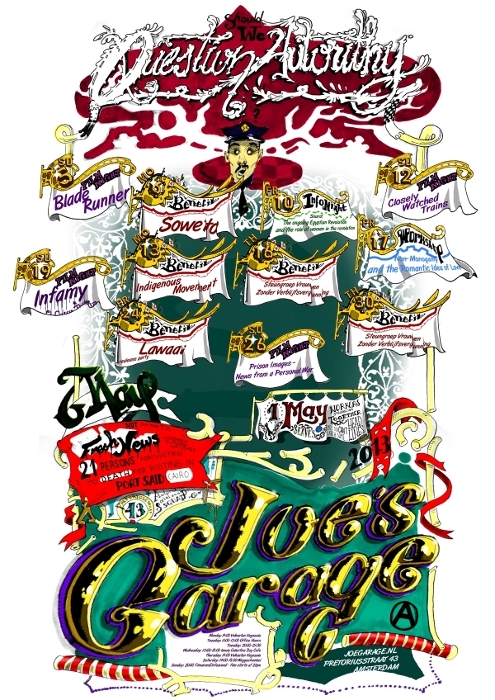 People eating, talking together, exchanging ideas, making projects, forgetting about the role models society is imposing…, all this and more is happening at Joe’s. The monthly workshop about gender and sexuality, “It’s more than what’s in your pants”, is going on with “How to be a man? 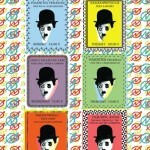 De-constructing masculinities“. Jeffrey is back for another speech and a film “Can Dialectics Break Bricks Cinema” with Frances. Also to be screened soon, The Joke, Repo Men and Micmacs. 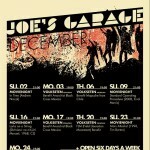 Squatted social center Joe’s Garage and its volunteers are bringing you another full month of events. As surprise appetiser, we serve an info night about rights in custody. Always useful when it comes to squatting empty buildings, demonstrating in the street and planing subversive activities. Further, you’ll be enjoying various benefits, for the SVZV (Support Group Women Without Papers), Soweto and the Black Fish. Still on the menu, the workshop series about gender and sexuality, “It’s more than what’s in your pants”, this month with a strong taste of Gender Revolution. The film program can be seen as a pretty heavy dish, from the less serious Iron Sky to serious documentaries such as Underground (about the Weather Underground Organization), and The Battle of Algiers (banned film, cult film but so up-to-date). A Kurdish Iranian movie night is announced with Turtles Can Fly from Bahman Ghobadi, an opportunity to discuss the on-going repression in Iran, a few months before presidential elections. You’ve heard it many times. While under arrest, never declare anything to the cops. But is that enough? Should you stop phoning, publishing pictures of your friends without their permission, choosing another email provider? When do you think you are not providing passive intelligence to the police? Political social centers and activist groups communicating on monitored “social media”, that is all good for the cops, they love it. Not only you are taking risks but you may put other people in danger. On the SO36 website, you’ll find a list of non-commercial providers for you to communicate in a safer way or where to move your website. For a local insight about police intimidation in Amsterdam, have a read to Observant, the December newsletter from Buro Jansen & Jansen, the Dutch research institute on intelligence and police matters. One of the favorite activities of Amsterdam’s mayor is throwing money out the window, evicting houses for emptiness. 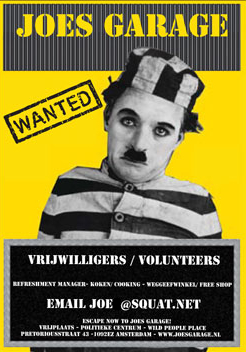 State sponsored gentrification, greedy housing corporations, we all know for who Van der Laan is working. 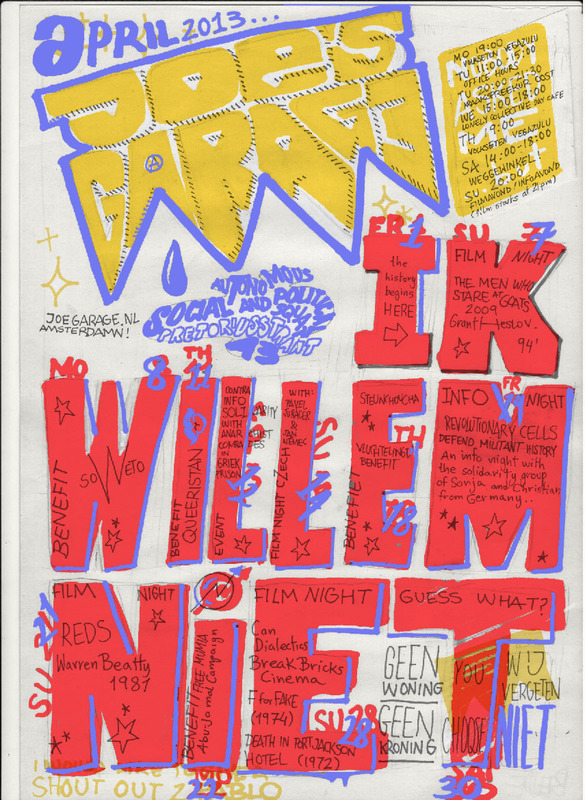 The four times squatted Swammerdamstraat 12 will need your support. Later in the month, it will be the turn of the Arent Krijtsstraat 1 in Diemen. Joe’s will start a series of workshops about gender and sexuality, called “It’s more than what’s in your pants“. This month’s topic is feminism. During the following months, we’ll discuss masculinities, gender identity and gender expression, queer activism and many more. Voices of Women Media is back with a new film “Breaking the Spell“. 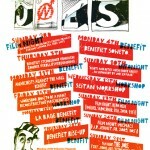 Further, Joe’s is hosting a benefit for Talent Project Philippines. You’ve heard of Rishi Chandrikasing, shot dead last November by the Dutch cops at the Den Haag train station. Following this murder, an infonight will deal with police violence, together with the screening of The Murder of Fred Hampton, a Black Panther activist. Also to come on the screen, Little Otik from Jan Švankmajer and the Czech New wave with a film from Pavel Jurácek, Case for a Rookie Hangman. Finally, Joe’s is bringing you Babboo Theater, a revolutionary, emancipated, explosive performance. Keep an eye on the calendar. The French Prime Minister is green in the gills about his Green coalition partners opposition to his private airport, not to mention his private security police cutting out the supports of the platform they stand on like their political masters do. The Mexican government is still un-comradely with the comrades of Guadalajara and the southern mountains of Chiapas. The Belgian government is still not modifying it’s position on Monsanto, the modifier (and seller) of nature. And closer to home the refugees will have to seek refuge from their nutty village in Osdorp, west Amsterdam where the Labour Party (former housing corporation lawyer) mayor has recently announced a prohibition of protests at the refugee protest camp, and the defeated squatters who wouldn’t need another hot eviction wave haven’t given up even after the latest heated wave of evictions, not to mention the never ending battle between the beleaguered Saint Nikolaas and the American invader Santa. And here in Joe’s Garage we’ve had inspiring evenings with the visit from two ZADists, the Mexican provinces, the village of the refugees and many more places. But don’t think we will be sleeping cozy by the yuletide fire because we have many events in store even now, with or without a hoodie!